The methylene chloride market, along with its end products, has witnessed a stagnant growth from the past few years, and it is expected to be the same in the coming years, especially in North American and European regions. Strategies adopted by the leading manufacturers to balance the current supply-demand issues, regulations across different regions, and development of newer applications across the vertical industries will be the key influencing factors in the methylene chloride market. The industry is expected to emphasize on different types and applications of methylene chloride, which is expected to significantly drive the demand in the next five years. The market is experiencing high growth in Asia-Pacific and RoW regions due to minimal regulations and their mounting industrial growth in the end-use industry. The large population, increased number of end users, and improving infrastructure can be other parameters for the rising demand of methylene chloride. The region is further expected to show an improved growth in the future, mainly due to high growth potential of the pharmaceuticals, foam manufacturing, and chemical processing industries in developing countries such as China, India, South East Asia, and Japan. The Asia-Pacific region accounted for more than 76% of the global market share in terms of volume in 2014. 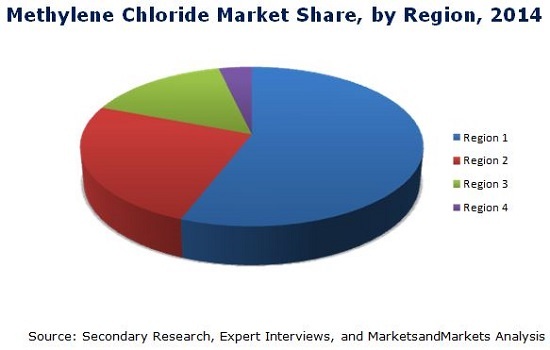 This study basically aims to estimate the global market of methylene chloride for 2015 and to project the expected demand of the same by 2020. It also provides a detailed qualitative and quantitative analysis of the global market. Various secondary sources such as industry journals, directories, and other paid databases have been used to identify and collect information useful for this extensive commercial study of the methylene chloride market. The primary sources experts from related industries and suppliers–have been interviewed to obtain and verify critical information as well as to assess the future prospects of methylene chloride. This research report categorizes the global market for methylene chloride by application and region along with forecasting volumes, values, and analyzing trends in each of the submarkets. A detailed segmentation is done for methylene chloride for the key regions that include Asia-Pacific, North America, Europe, and RoW and further for key countries in each region. The global methylene chloride market is worth USD 708.0 Million in 2015 and is estimated to reach USD 892.9 Million by 2020, at a CAGR of 4.75% between 2015 and 2020. The global methylene chloride market, along with its end products, has witnessed a stagnant growth from the past few years, and this growth is estimated to continue in the coming years. High demand growth for methylene chloride in emerging economies such as China, Japan, and India is the keydriver as per the current market dynamics. The demand is also backed by newer and industrial applications. Upcoming safety regulations and innovative techniques developed for methylene chloride will be key influencing factors for the global market with the increased emphasis on different applications. Currently, Asia-Pacific is the largest market for methylene chloride, with China holding the largest share in terms of volume in 2014. Another important market in the region is India. The market size in terms of volume is comparatively low in the RoW region, but is projected to record a stable CAGR between 2015 and 2020. The Asia-Pacific and the European regions are the most active markets in terms of strategic initiatives, owing to their emerging and mature market demands, respectively. The European market is highly regulated due to its growing concern on industrial toxic gas emissions, thus growth is torpid in the region. High growth in end-use industries, augmented local manufacturing, and increase in number of domestic players in vertical market segments such as pharmaceuticals, foam manufacturing, chemical processing, and others in the Asia-Pacific region is the important driving factors for methylene chloride. The key methylene chloride manufacturers include Dow Chemical (U.S.), AkzoNobel N.V. (Netherlands), Ineos (Switzerland), Solvay S.A. (Belgium), Kem One (France), Shin-Etsu (Japan), Gujarat Alkalies & Chemicals Ltd. (India), and Ercros S.A. (France). This report covers the methylene chloride market by key regions and important countries in each region. It also provides a detailed segmentation of the market on the basis of application such as pharamceuticals, chemical processing , foam manufacturing, paint remover, and metal cleaning along with its projection till 2020 for different regions. 7.2.1.1 U.S.: Methylene Chloride Market. 7.2.1.2 Canada: Methylene Chloride Market. 7.2.1.3 Mexico: Methylene Chloride Market. 7.4.1.1 Germany: Methylene Chloride Market. 7.4.1.2 France: Methylene Chloride Market. 7.4.1.3 Italy: Methylene Chloride Market. 7.4.1.4 Others: Methylene Chloride Market. 7.4.1.5 Turkey: Methylene Chloride Market. 7.6.1.1 China: Methylene Chloride Market. 7.6.1.2 Japan: Methylene Chloride Market. 7.6.1.3 India: Methylene Chloride Market. 7.6.1.4 Others: Methylene Chloride Market. 7.8.1.1 Russia: Methylene Chloride Market. 7.8.1.2 Brazil: Methylene Chloride Market. 7.8.1.3 Others: Methylene Chloride Market. 10.1.1 Company Snapshot: Akzonobel N.V.
10.3 Gujarat Alkalies and Chemicals Ltd..
10.6 Shin-Etsu Chemical Co. Ltd..
10.6.1 Company Snapshot: Shin-Etsu Chemical Co. Ltd.